The same hardware was working fine (Plug & Play without any configuration) but I stopped using the screen for a while (and many Kernel updates were done). Now the screen is not working and even xrandr is not showing it. The screen is VGA but the laptop is HDMI and there’s an adaptor in between (same setup wored fine previously). Your time is really appreciated! Thanks in advance. I started with testing nvidia-installer -t first and after it was all green I went for the installation and it succeeds. After the reboot, the Desktop Manager no longer works and only a black screen with a marker are displayed. I used tty2 and tried nvidia-installer -b and -n but none could complete so I removed the package and reboot but still stuck on that black screen. removing the package nvidia-installer will not revert the settings and installed programms the script is pushing to your system. @joekamprad Thanks for your attention. I have guessed so and I have tried it before removing the package but it threw errors (I don’t remember them though). Now I have tried again. Installing the package succeeded, but the nouveau option didn’t work. It gave errors about multilib file can’t be retrieved because hostnames can’t be resolved. I have tried pinging google.com and it also failed. Try lshw -c video, what driver does the nvidia card use? On previous laptops the HDMI output has been driven by the discrete GPU, ie the nvidia card. So if the card is not in use, has bad drivers etc, the hdmi port won’t work. If I remember correctly the nvidia drivers doesn’t work 100% with the bleeding edge kernels, they are usually a version or two behind, but I might be wrong about that. Was a while ago since I used nvidia, back then it only worked with 4.13 tops even though the current version was 4.16. Back to my system now! It was wireless. My bad - I should have tried a wired connection before I ask. It worked with the wired connection and I ran the nouveau option and it worked. I am wondering how the system was able to install the package (after being removed) when there was no connection? @stingray454 Thanks for your reply. So now back to the original issue, any suggestion? Should I roll back to a tested Kernel? The first GPU has no driver loaded. The second has driver=i915 (ie intel driver), so that would probably make the first your nvidia gpu. As to why the driver can’t load, it could be a number of things. Make sure you have the latest driver installed, and I would try earlier kernel versions as well. As long as it doesn’t load the driver I wouldn’t have much hope of the video out working from that card. I saw a Kernel update available (4.17.10) along with some Nvidia packages so I proceeded with a full upgrade, and rebooted, and I was surprised that the external screen is now working. The strange thing now is that the laptop screen no longer works. Only external. I started with toggling external screen settings (left, right, primary only, external only, unify, etc). When I reboot, the booting options are displayed on the laptop display. Once Antergos is loaded, the login screen is displayed on the external display only. On the laptop screen only a still (not blinking) marker displayed. If I went to CLI (CTRL+ALT+F2), the CLI is displayed on the laptop screen. 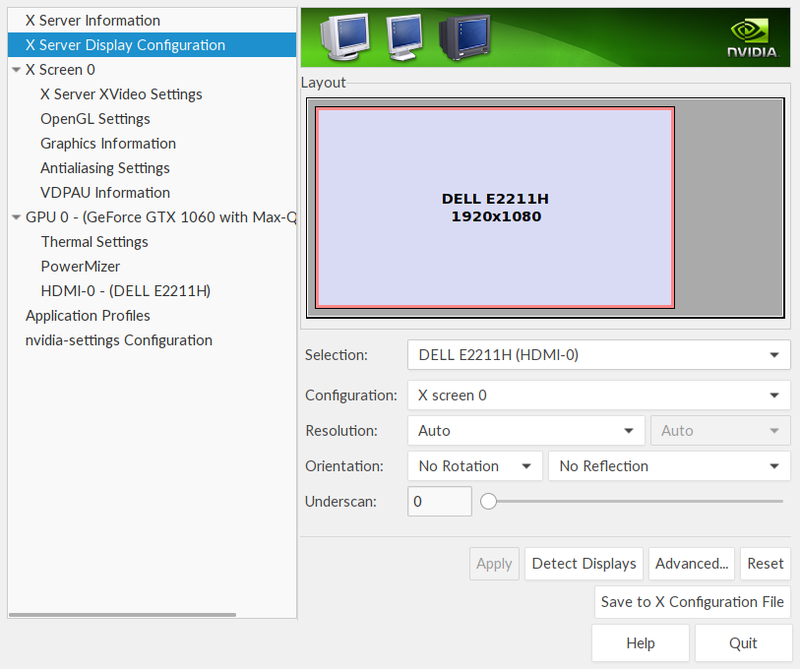 @ahassoun do you try setup with nvidia-settings ? Does it mean I will struggle with this setup forever? Here’s what I got with nvidia-settings GUI tool. DELL is the external display by the way. If there is a will, there is always a way! For installing bublebee, I tried both the (automated?) way of the nvidia-installer package and the step-by-step method of https://antergos.com/wiki/hardware/bumblebee-for-nvidia-optimus/ . My BIOS doesn’t offer any display configuration options by the way. I will post the errors soon.